■ Mastering of thoracic and retroperitoneal anatomy, and considerable prior experience with major laparoscopy and open surgery are prerequisites to perform thoracoscopic transdiaphragmatic procedures (10,22). ■ Thorough familiarity of the anesthesia team with double lumen endotracheal intubation techniques is mandatory for single-lung ventilation. ■ Confirmation of adequate deflation of the appropriate lung on clamping the double lumen tube by auscultation at intubation, after prone positioning, and prior to skin incision is necessary (22). 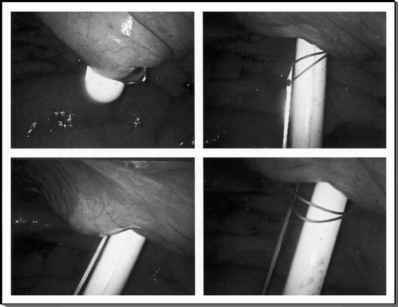 Inadequate functioning of the double lumen tube should be detected immediately by continuous monitoring and promptly addressed intraoperatively by bronchoscopy. ■ Rigid valveless ports (Fig. 4B) allowing free passage of various instruments are employed given no CO2 pneumo-insufflation is necessary. ■ The need for active retraction of the liver or spleen is minimal due to prone position of the patient, which also allows a direct approach to the adrenal gland, and the related gravity induced anterior displacement of the liver or spleen. ■ Diaphragmatic incision directly over the adrenal gland should be precisely planned under real-time ultrasonographic guidance. ■ Main adrenal vein control is safely and rapidly performed using an articulating vascular stapler. ■ Needle puncture of the lung should be avoided at all times during diaphragmatic repair to prevent inadvertent creation of a bronchopleural fistula. ■ Adequate experience and skills with thoracoscopic techniques and team work with an expert minimally invasive thoracic or spine surgeon are strongly recommended.